Ah! I was so honored to be able to document this monumental moment. Stephen has been a good friend of mine for many years, and we've joked and talked about "that day he would get married" - (luckily I beat him to it first- haha jk!!!) but I was so happy when he revealed to me when he met someone wonderful!! Ester has been an amazing addition to Stephen's life, and both of them make such a power couple. Their romance brought them all the way from San Francisco and now to New York City. My husband and I love spending time with them.. they're so easy going, down to earth and fun to hang around... I am so excited for their marriage and know that it will be blessed and fruitful!! Now let me tell you about this photographic experience. 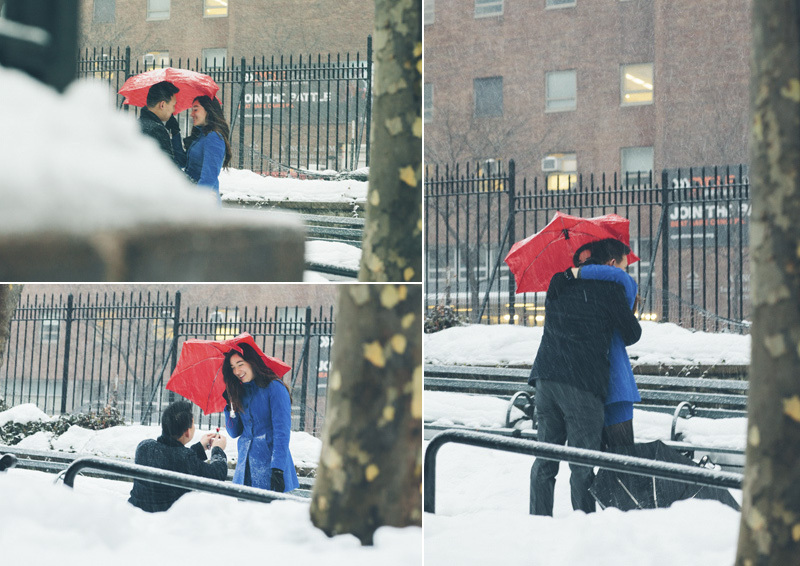 It was definitely my first "snowstorm" proposal shoot and never experienced anything like so. But it was so worth it! New York City has been experiencing a LOT of crazy snowstorms, we seem to average about one per week these days... so this was last Saturday, 2/15/2014. The park was a location over on 67th street and 1st avenue, which was close by to the restaurant that Stephen had planned to celebrate with Ester afterwards. The park was a pretty flat space.. so it was really difficult to find a proper hiding place. So when they walked in, I literally was sprawled out behind small corner of a gate, trying to get a good angle on the happenings. Here are some photos of the event and a short little photo session we had after! They were seriously TROOPERS with withstanding the fast whipping snowflakes!! Enjoy!! Stephen bought Ester diamond earrings and a gold band as her engagement "ring"- this was something special to her and he got her exactly what she wanted! So cute and different!